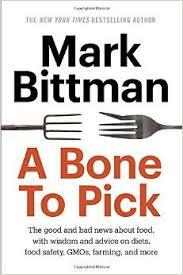 Mark Bittman started writing a food column for the New York Times in 2011 and the book A Bone to Pick is a collection of those columns. He looks at the broken food-production system, both in the United States and in the rest of the world, which has resulted in over a billion people going hungry every year. Not only that, but another billion are malnourished or undernourished, even in supposedly wealthy countries such as the United States. Bittman looks at what he sees as problems which need to be addressed in order to improve food production, reduce waste, and improve nutrition. There are plenty of stark facts that are presented early in the book: that the vast majority of grain produced in the United States never makes it to the table (it's either used as animal feed, converted to bio diesel or wasted); that up to 98% of pesticides used end up other than where they were intended (leading to even more pesticide use); that government "farm subsidies" never lead to edible food. These facts alone are enough to cause concern and outrage. The author goes on to discuss how "inefficient" small farmers are actually producing nutritious, edible food, and should be subsidized instead of the large, environmentally destructive industrial farms. Many ideas are presented which will help to solve problems (waste, environmental, dietary, etc.) related to food production and distribution. Some of these include taxing junk foods (such as the tax Mexico implemented in 2014), crop rotations (to replenish the land and reduce the reliance on pesticides) and support for smaller farmers (to keep farmers on their land and increase local access to healthier foods). Is there enough wide-spread determination to implement such ideas? The articles in the book, while written over several years, are gathered into sections such as "Big Ag, Sustainability, and What's in Between, " "What's Wrong with Meat?," and "Legislation and Labeling." While each individual article contains interesting information, the fact is that when they are grouped together like this, they tend to get a bit repetitive (all 10 articles in the "Sustainability" section, for instance, mention how most grain is turned into animal feed, and how 1/3 of the population is hungry while another 1/3 is obese/malnourished). Overall, the book brings up many distressing and unpleasant facts about where our food comes from, and how the entire process could be so easily changed to eliminate both hunger and diet-related diseases. We can only hope that the pressing issues presented in this book will be addressed so that everyone will have access to the nutritious, bountiful foods that are produced every year (rather than the food being wasted or converted to non-food purposes).